While there are many different lung disorders, the YRPFT has developed a special interest in Chronic Obstructive Pulmonary Disease (COPD). While you can still be assessed and managed for many other lung conditions, such as Asthma, Bronchitis, etc, our team of Respirologists will work with your family physician or other community specialists to manage these. Should you be diagnosed with COPD, you will then be offered an opportunity to participate in our COPD Rehab Program. This involves 8 weekly sessions, each lasting 2 hours, that combines both education and exercise to help better control your COPD symptoms. Chronic obstructive pulmonary disease (COPD) is a lung disorder that makes it hard to breathe. It is the name used to represent chronic bronchitis, emphysema or both. If you are reading this manual, you have likely heard one or more of these terms thrown around to describe your condition. While they represent two different conditions, most people with COPD have both. So, going forward, we will simply use the name, COPD. So what exactly is COPD? The word “chronic” means long-term and so the first thing to understand is that by doing nothing, it usually gets worse with time. In fact, there is really no cure. Instead, the goal is to improve daily symptoms so you can live your life as normally as possible. Having control over COPD rather than it having control over you, is what this program is all about. The word “Obstructive” implies that flow of air into your lungs is being blocked or interfered with. This is exactly why you feel short of breath. Air, which contains exactly 21% Oxygen, is necessary for life. By contrast, the oxygen content in water is 0.001%. This is why you can’t breathe under water and exactly why those suffering from COPD often feel like they are drowning in air. The word “Pulmonary” is simply a medical way of saying it involves the lungs. You can think of your lungs as two sac like organs lying within either side of your chest cavity. However, the pulmonary system, involves much more than just the lung organs. Rather, it best to think of it as a tree (albeit upside down). Looking at it in this way, the trunk is like our windpipe or trachea. Assuming that the trunk then gives rise to only two major limbs, in our model, we would call these as the left and right bronchi. 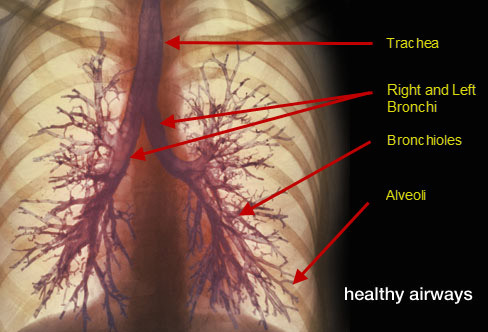 From here, each bronchi can break out into many small branches, which we will call bronchioles. Finally, each of these small branches (bronchioles) and give rise to many leaves. For our purposes, each leaf is called an alveoli. Just as there is a complex process that occurs in each leaf of a tree, so too do the alveoli involve an equally fascinating process whereby oxygen that enters into our blood stream via the alveoli is exchanged for carbon dioxide that we then breathe out. So, what is COPD? It is a long-term condition (disorder) that in interferes with the ability to get enough air into your body. 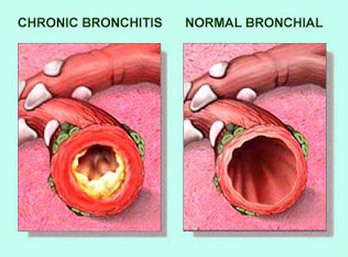 The term Chronic Bronchitis is the most common problem for those suffering from COPD. It usually involves a troublesome cough with a lot of phlegm. It is caused as swelling of the bronchiole walls narrows the open duct inside. This is made even worse as mucous further crowds what little airway space remains. Over time, the above can scar the airways, making the stiff and difficult to open. 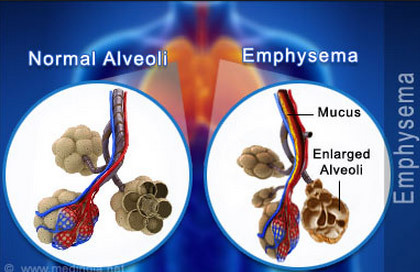 On the other hand, Emphysema is the result of the tiny air sacs (alveoli) becoming damaged such that they no longer function in a normal manner. The end result is that they become enlarged, giving the appearance of large open spaces in the lungs called “bullae”. Since the alveoli are essential for normal oxygen exchange in the lung, the loss of this important structure results in less oxygen being absorbed. 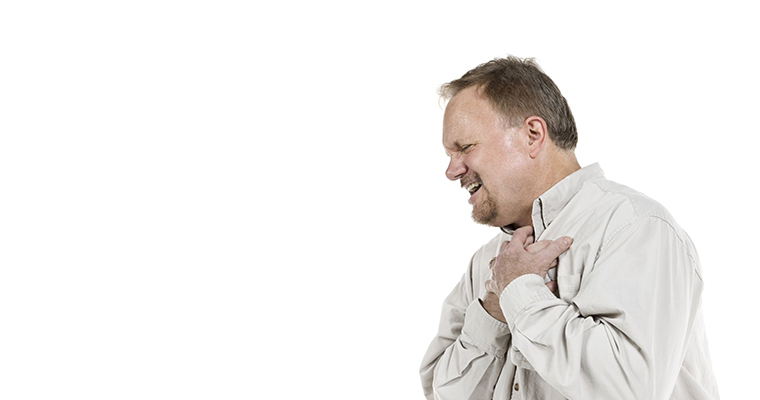 The most common symptom of Emphysema is therefore, shortness of breath. Given the COPD is a long term (chronic) condition, with no real cure, what does this really mean for your health? While there is no cure, this does not mean that you can expect to improve your daily symptoms. In fact, that is the whole point of this program. Living Well with COPD is our goal and it is very achievable. While there are many medications on the market to help control the symptoms of COPD, a much overlooked part how you can change the natural progression of COPD involves improving physical fitness. In fact, other than quitting smoking (if you smoke), it is likely the single most important change that you make to improve your life. Shortness of breath limits what people with COPD can do. As a result, many ordinary activities such as getting out of bed in the morning, climbing stairs and even walking can become significant challenges. It is no wonder why the mere thought of exercise is very frightening for most people with COPD. For this reason, it is important to reset the bar in terms of what we mean when we use the term “exercise”. It is not the same as what it may have meant to you when you were in your teens and early adulthood. You are not training for the Olympics. ”. In other words, what was once an easy exercise during those younger years, can now feel like climbing Mount Everest. The point here is that each of the activities we will be recommending to you while in this program should feel very comfortable and not discourage you in any way. Having a strong motivation will only take you so far. If anything is uncomfortable, you will eventually quit doing it. That is only human nature. Improving muscular strength, flexibility, cardiovascular fitness and mental well-being represents the four cornerstones of any pulmonary rehabilitation program. If done correctly, improving your overall physical fitness will in turn, improve your overall mood. During the 8 week program, you will be exposed to routines that are designed to improve your strength and flexibility. In terms of your cardiovascular or “aerobic” fitness, you will be asked to engage in some type of activity, preferable something that you enjoy (walking, cycling, swimming, etc) for no more than 20 – 30 minutes, up to 4 times per week. Again, this should be at a very comfortable pace. If you are not having fun, you haven’t picked the right activity. One way to help keep your pace on track is to consider what your heart may be telling you. The average heart rate for most people while resting is around 72 beats / minutes. 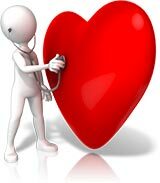 However, the maximum heart rate that a person can achieve is 220 beats / minute minus their age. For example, if you are 50 years old, even under the most trying athletic conditions, your heart can’t beat faster than 170 beats / minute. What’s more, at that rate, you would feel that you were going to die. Instead, it is recommended you exercise in such a way as to maintain your heart rate somewhere between 65% – 80% of the maximum. So, for the same 50 year old, the exercise should not push their heart rate faster than 135 beats / minutes (the 80% mark). However, to get an effect in terms of fitness improvement, the heart must beat faster than 110 beats per minute (the 65% mark). This is a very important consideration to remember. Once you start walking, swimming or cycling, after about 5 minutes, you should assess your heart rate (we will show you how to do this if you do not know). In the context of this program, it would be best if you exercised at around the 65% of maximum heart rate. This will make the experience more comfortable and enjoyable. In order to improve your comfort with exercising, it is very important that you become fully aware of you breathing. Many people reflexively hold their breath when asked to exert themselves. This can be disastrous for someone with COPD. Remember, you often have shortness of breath without doing very much. If we turn up the notch even slightly and you also hold your breathe, …. Do I need to say anymore? We will spend a lot of time focusing on breathing in (inhalation) and breathing out (exhalation) during each exercise. Every breath is synchronized with each motion. It is like a dance routine for your lungs and your limbs. It will take some time to get it all coordinated but once you do, you will never look back. Another important factor is to use “pursed lip” breathing while you exhale. 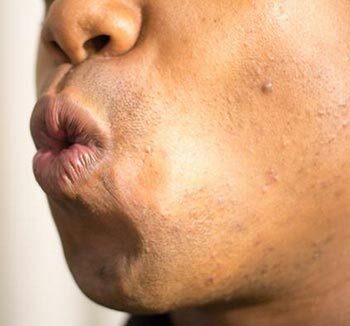 While this is taught more during the program, quite simply, it involves pursing your lips (i.e. the kissing position) while breathing out. Improves your ability to extract oxygen from the inhaled air. While this Program is scheduled for 8 weeks, the intent is having it last for the rest of your life. And, we intent to extend that life if you take up us on the offer. Incorporating fitness into your entire lifestyle, making it as routine as eating and sleeping, will pay off dividends long after the two months with us is over. If you are having any problem keeping up with the routine placed in front of you, let us know at your earliest opportunity. Reconditioning your body is as essential to taking your medications properly. Your renewed focus on your health will allow you to keep Living Well with COPD. According to figures from a recent Nielsen MarketTrack for the 52-week period ending June 28, 2014, Canadians bought $31 million worth of OTC sleep aids, a category growing at 13% per year.